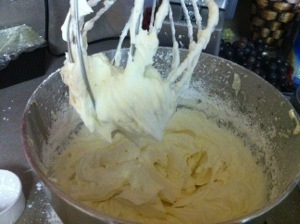 This is my mom’s famous buttercream Icing. I remember as a little girl, watching her make and decorate many birthday cakes for our friends and family. She had such an amazing talent and eye for just about any style of cake (she even made an ET cake when the movie came out). I hope you enjoy this recipe as much as my family has. Enjoy! Combine the butter, Crisco, and salt in a large bowl and beat on low speed for 5 minutes. Add the vanilla, butter flavor, and almond extract and beat until well blended. Turn off mixer and add half the confectioners sugar I highly recommend sifting your confectioners’ sugar before using. Sifting eliminates those clumps that sometimes form and it blends together better than un-sifted confectioners sugar. Mix on the slowest speed the mixer has. Mix in the remaining sugar 1/2 cup at a time, until all the sugar is mixed ‘in. Turn the mixer up to medium and beat until smooth and creamy. This should take about 5 minutes. 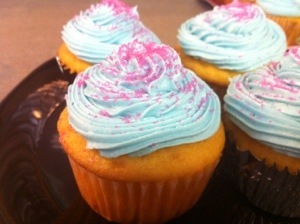 If icing seems too thick to spread, beat in up to 1 tablespoon milk to loosen it.